Are you one of the many to beat every episode of Rovio’s popular Angry Birds game and starving for some new challenge? Well, you’re in for a special treat this summer, and the timing couldn’t have been any sweeter. With summer officially here, it doesn’t mean that those Angry Birds are going to be jetting off to some cool vacation resort and hiding low, but instead, they’re jumping right back into action with their sixth holiday themed episode – Summer Pignic. This new episode features 30 new summer themed levels that will keep you at it against those baddies that are trying to keep summer from being fun. Additionally, the new update for Angry Birds Seasons brings along an in-game summer themed greeting cards system that allows players to send to their friends. Still, you’ll more than likely keep a good pace with this one mainly because it follows in line with other levels of Angry Birds Seasons – meaning, you can only unlock one new level per day. So what are you waiting for? 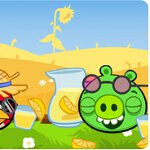 Get the new version of Angry Birds Season to jump start your summer! I'm really sick of these Angry Birds. Damn bs game, it got reeeeal old now! this crap ia freaking gay!! How are they going to limit people on however many levels they can play in one day?? Bunch of bs imho!! I'm deleting it just for that very reason!! CRAP! !